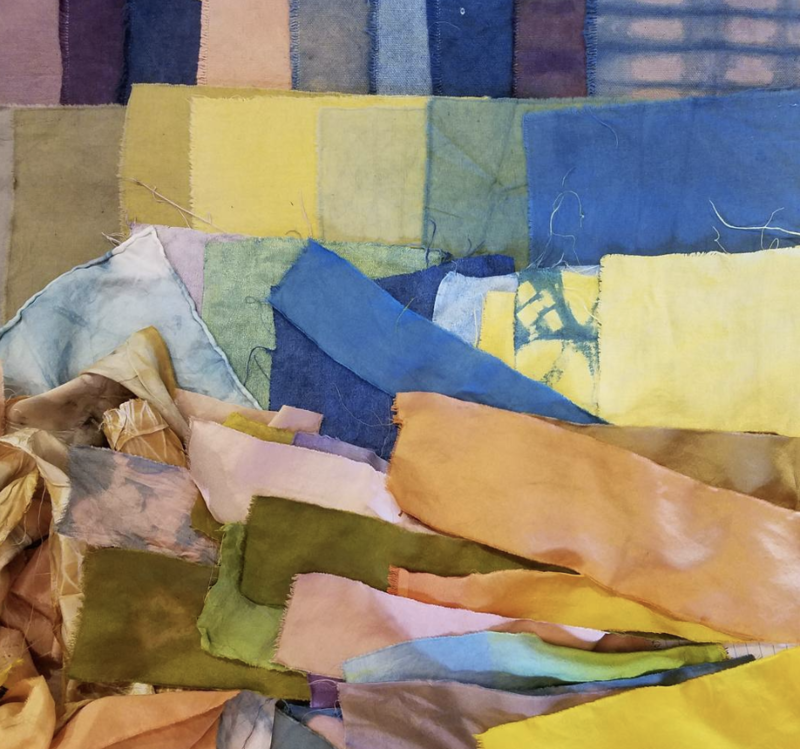 This class explores the science, history and art of natural dyes through the process of converting plant material to dye upon cloth. We will identify native dye plants, learn how to harvest and process plant materials, then use them to create various dye baths. We will learn ways to modify those colors to create a range of hues, and talk about how to get the most from your harvest. Students will create a sample book including recipes and a variety of swatches to take home and continue their explorations. Indigo is a historically relevant plant which contains dye that at one point in history was worth more in weight than gold. This class will teach a small amount of history and the fundamentals of how to create and maintain a healthy indigo vat through fermentation using food safe, organic ingredients. We will have time to explore the nature of this chemical transition and dye fabric together to see the instant reaction of indigo dye on cloth. Along with instruction, students will receive an information booklet of recipes and basic dye guidelines. Included are one silk scarf and one cotton handkerchief. 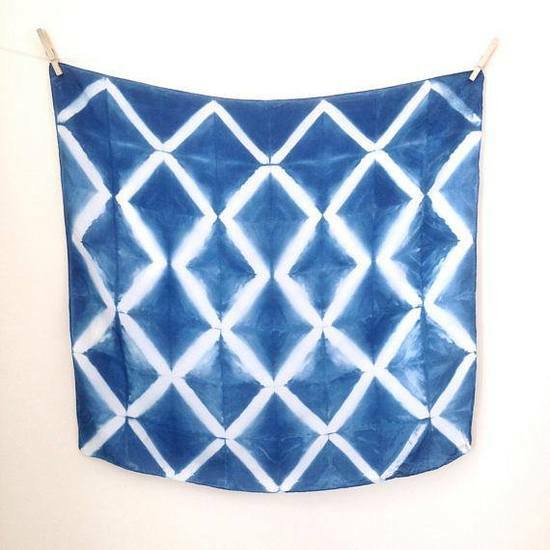 Learn the basics of Indigo dyeing and the Japanese art of Shibori. During this workshop we will fold, tie, and use resist methods to create unique designs on silk scarves. Each scarf will be hand-dyed in a beautiful blue vat of natural indigo. Everyone will leave this make + take workshop with a silk scarf of their own creation! 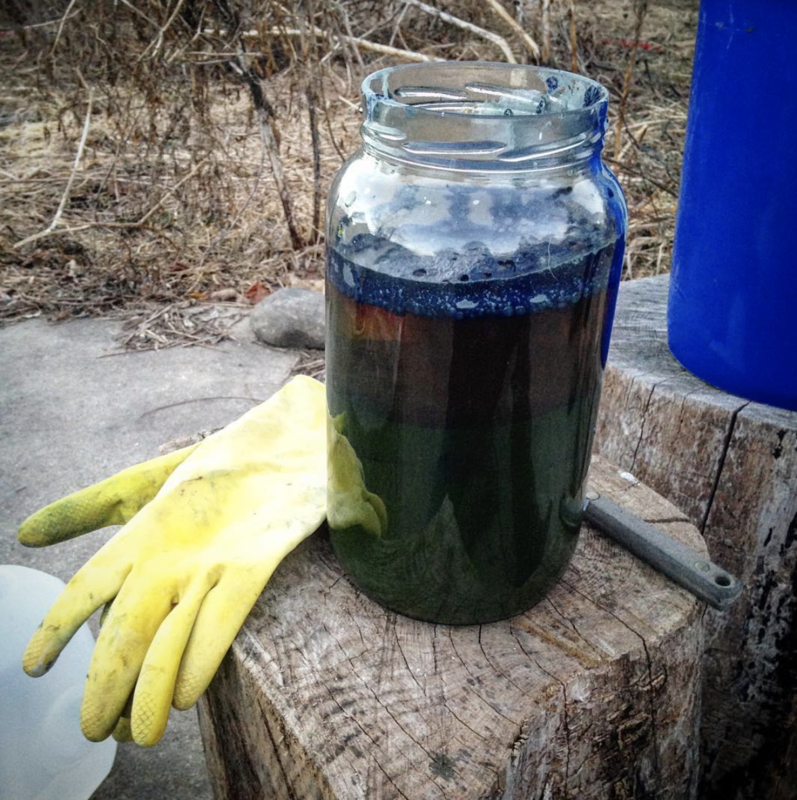 During this 3 hour make & take workshop, you will learn about the dye plants we have grown and also learn how to identify native plants that can be foraged in the Detroit area. 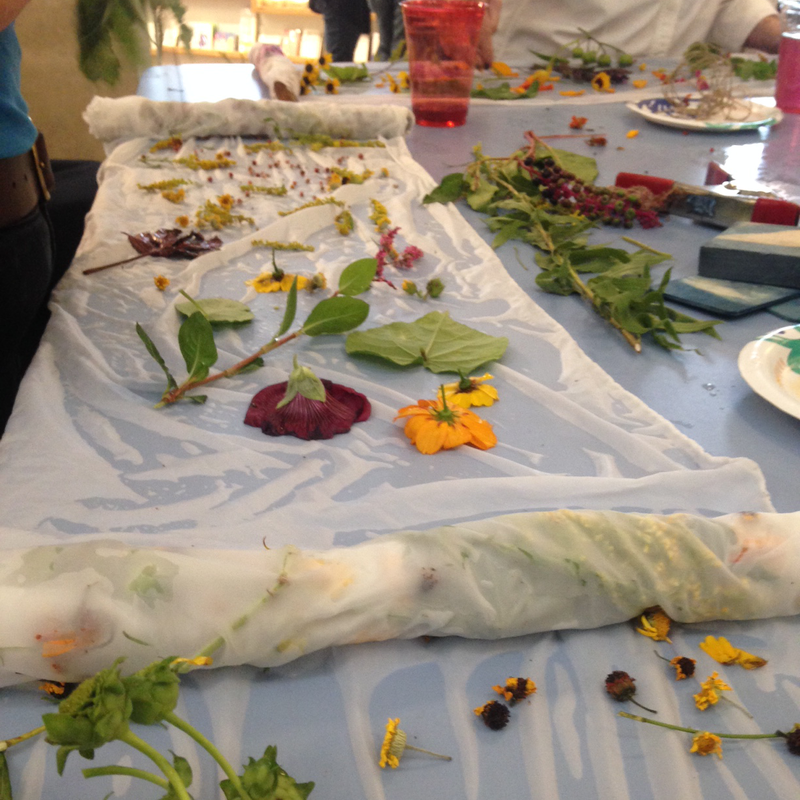 We will then demonstrate a bundling technique with the freshly gathered plants to create eco-print silk scarves. Bundles will be hot processed to transfer color. 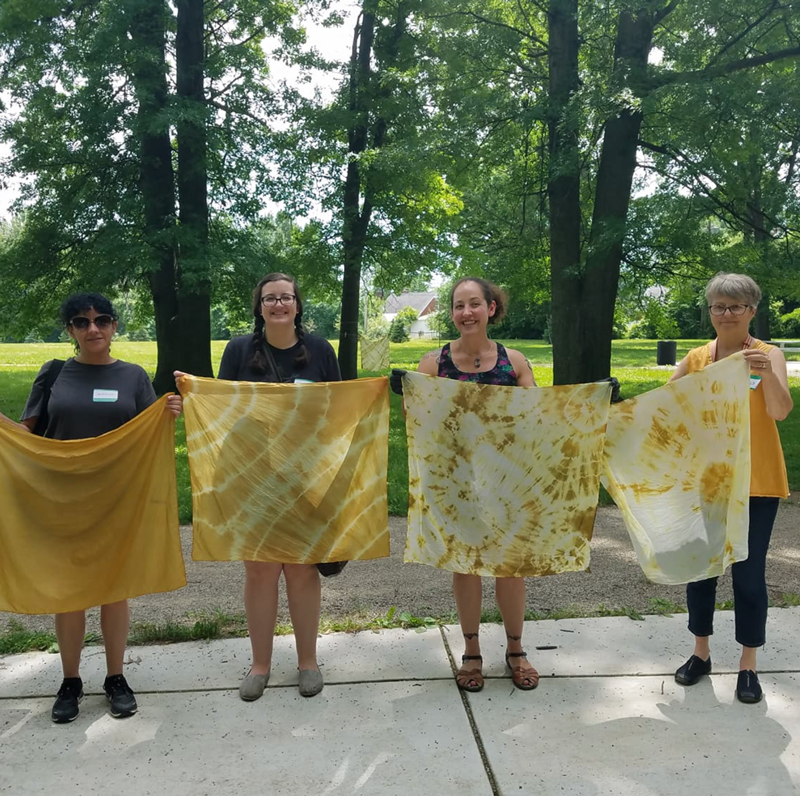 Everyone will take home a silk scarf of their own creation and the know-how to continue growing, foraging, and using natural dyes for future projects. Color Wheel and Fungi Freights Studio join forces to teach the wonderful art of dyeing with Mushrooms and Lichen. This 3 part workshop will include a lecture on basic mushroom anatomy, identification and the chemistry behind fungal dyes followed by a mushroom foray where we will go over basic skills on where and how to find your own dye mushrooms. 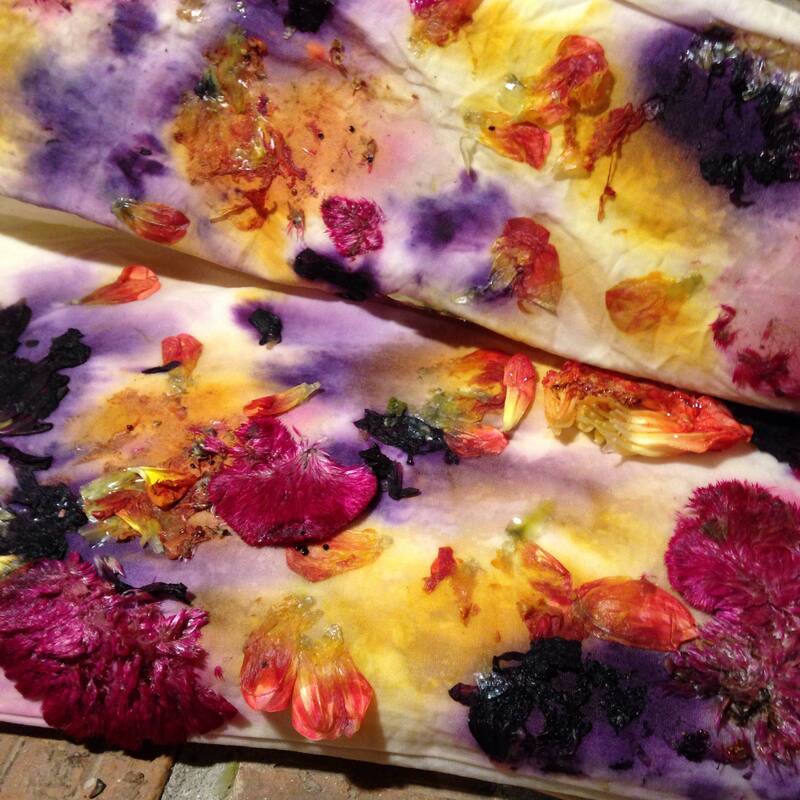 Hands-on experience with mushroom dyes will be offered and everyone will go home with their very own dyed silk scarf! Curious about natural color, but not sure how to get started? Each participant will receive a fair trade organic cotton pillowcase to use as their canvas. A variety of blooms and leaf trimmings will be available to experiment with. We will provide detailed instruction on how to work with these natural items to create colorful patterns using a pounding technique. Copyright © 2016 Color Wheel Michigan. All Rights Reserved. Created by Lauren Mathieson.